Many marketing emails have gone out in the past week leading up to this spooky day. Some may be tacky and not amusing, but others have been creative and tasteful. Here are a few of our hand-picked favorites. This clothing company is known for their minimalist style and their design for this email was nothing short of that. 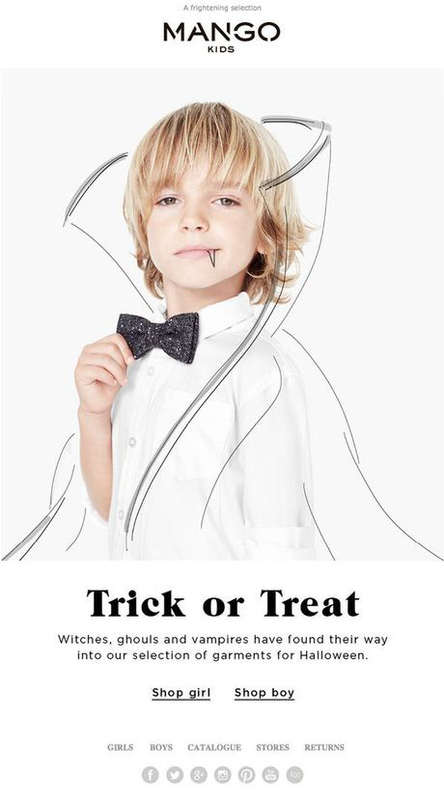 This email campaign served as a great example of how to take existing marketing materials (like the image of this little guy in a white dress shirt) and tastefully transform them to fit the holiday. Spirit created a handful of cartoon graphics for Halloween that were perfectly on-brand by incorporating their colors and primary typeface with hand-sketched images. CVS surprised us with their Halloween promotions this year. The simple graphics incorporating a Halloween feel with their products and branding. This UK based company managed to make their not-so-spooky product apply to Halloween through this creative email graphic of spelling "boo!" out in various tools. Clever! Have any marketing emails with clever designs that you'd like to share? Do so in the comments below!